Traveling is one of the best ways to bring a family closer. Not to mention its ability to widen your and your children’s perspective of the world around you. There is no denying that kids can be a handful at bedtime. However, a new environment and the excitement of the trip may cause your kids to feel even more restless than usual. 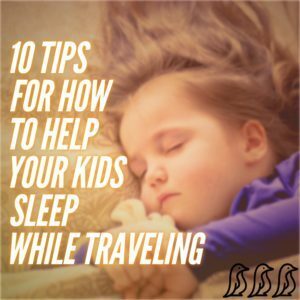 Here are ten easy tips on how to help them sleep during the trip. The first step is to always plan ahead. If you plan on staying at a hotel with a toddler, call in advance to reserve a crib since most of them only carry limited cribs. Make sure the crib is comfortable. Reserve a room that’s spacious enough for the whole family. Don’t settle. Consider the entire family, and find amenities that are suitable for everyone, especially if you’re bringing along two or more kids. Does the hotel you’re staying at have a playground, a pool or other kid-friendly amenities? If you’re traveling to a different time zone, try working your kids’ sleep schedule around that specific time zone at least a week in advance. If strictly followed, it shouldn’t take more than a few days for them to settle into their new sleep pattern. While your stay may only be temporary, the new environment and excitement may cause your kids to experience some restlessness. One thing you shouldn’t change is their pre-bedtime routine. It maintains their nightly structure, so they’ll know when it’s time to sleep. Sneak in a few naps during the day, but don’t let them nap for too long. Give them an hour or two to re-energize for the rest of the day’s activities. Also, make sure their naps are nowhere near close to the actual bed time. Bring at least one or two items that you know give them a sense of comfort and security. For toddlers, it could be something as small as a pacifier. For toddlers and older kids, these are mostly stuffed animals or toys that they constantly carry with them or sleep with. There are Smartphone apps that help calm down your children when it’s time for bed. One of the more popular ones is the White Noise app, which offers soothing ambient sound options such as ocean waves, heavy rain, or the sounds of a tropical forest. 8. Tire Them With Fun! As much as possible have your kids engage in physical activities, such as playing at the beach, swimming or riding a bike. Once the excitement wears out after a day full of activities, it’s easily replaced with satisfaction and exhaustion. They’ll fall asleep faster by the time bedtime rolls around. Vacationing is all about having fun. Though it’s important to keep your kids on a consistent sleep schedule as much as possible while traveling, it is after all a vacation and it’s perfectly fine to break the rules from time to time. Your kids may have a difficult time re-adjusting to their normal sleep schedules once you’re back home, especially after vacationing within a different time zone. Make sure to slowly ease them back into their usual pre-bedtime routine. Be patient! It may take them up to 3 or more days to re-adjust.